El Nacional is a relatively new restaurant complex close to Barcelona’s centre offering a beautiful space to eat in and a trendy, buzzing vibe. Do the food and value-for-money measure up? Maybe, maybe not. El Nacional is a ‘restaurant emporium’ in which four restaurants and three bars share the same open space. Just five minutes’ walk from downtown’s Plaça Catalunya, the complex occupies a block bounded by four roads. It’s huge, covering around 3700 square metres of floor space and accommodating 770 diners. Since its construction in the late nineteenth century, the building has served as a modernist theatre and exhibition space, a textile and dye factory, a car dealership and eventually a car park. After years of neglect, the building seemed doomed until investors spotted its potential. The interior design reflects this history, and one of the pleasures of spending time at El Nacional is to feel its heritage all around you. Interior designer Lázaro Rosa Violán describes himself as a ‘creator of atmospheres’ and he certainly lives up to that in his design for El Nacional. Violan has capitalised fully on the building’s industrial and modernist roots to create a spectacular interior space. The high-vaulted Catalan ceilings carry skylights that reflect El Nacional’s industrial past (and also make the interior light and airy). A plethora of low-hanging light-fitments adds a touch of chic. Mosaic ceramic tiling, exposed steelwork, a vast set of suspended wheels: everywhere you look there is something to interest and engage. That even includes the toilets, which display fascinating photographs of the building in its former incarnations. The attractiveness of this setting made El Nacional popular from the beginning. The opening weekend in 2014 attracted around 6,000 people, and it has remained in fashion with locals and tourists. At peak times – after 9pm and weekends – it can get very busy. With hundreds of people in a space that’s only nominally divided, visitors describe the atmosphere as ‘vibrant’, a ‘fun vibe’ and ‘huge, loud, crazy, fun’. Many visitors love this ambience. Just be aware that if you’re looking for cosy and intimate, this isn’t it. With four restaurants and three bars, one thing not lacking at El Nacional is choice. If you’re in the mood for seafood, you can choose your type and weight of fish at La Llotja. The restaurant also serves shellfish of various types and seafood-based soups. Carnivores are taken care of courtesy of La Braseria, with your meat quota cooked in front of you in a wood-fired oven or on a charcoal grill. The obligatory tapas dishes are supplied by La Taperia. There’s an unusual system in place here, with the servers walking past in endless procession carrying the various tapas staples. When a dish takes your fancy, you call the server over to order it. Your choices are rounded out by La Pardeta, which caters for those wanting snacks, sandwiches, light meals, pastries, smoothies, milkshakes and so on. The bars also serve food and supply regional produce. Oysters, caviar, preserves and pickles, cheeses, sausage, and various sweet and savoury snacks are on offer. You can wash all that down with champagne, wine, beer or cocktails as the mood takes you. With some of the restaurants we’ve covered, there’s a real consensus on the quality of food (either good or bad). In the case of El Nacional, a visit to Trip Advisor shows many reviewers are perfectly happy with what’s on offer. They praise the freshness of the produce and enjoyed mix-and-matching from several specialist restaurants. However, there are also a number of dissenting voices who consider the quality of the food indifferent. One issue may be the price-point. Six tapas dishes and a bottle of Sangria, for example, set one reviewer back 60 euros. In Barcelona, higher restaurant prices result in sky-high expectations, and for some visitors, El Nacional falls short of those standards. As for service, again the picture is mixed. Some reviewers on Trip Advisor and other sites received slow, unenthusiastic service. One commented that ‘the wait was endless for both ordering and paying’. The tapas service came in for some criticism: one reviewer found that it was ‘very difficult to successfully obtain a dish from the roving servers’. As in any restaurant, avoiding the busiest times will definitely help. However even at a quiet time, one reviewer received service that he described as ‘the worst we had in Barcelona’. Bear in mind, however, that this is by no means a consistent picture. Many reviewers found El Nacional’s service efficient and helpful. El Nacional offers an upbeat, lively atmosphere and plenty of choice in a beautiful, historic building providing a spectacular dining experience. This alone may be enough to recommend a visit especially if you are visting the city or are out to impress a visting client. However, be aware that for some of the restaurants a proportion of visitors are underwhelmed by the service, especially at peak times, and some consider the food on the pricey side. 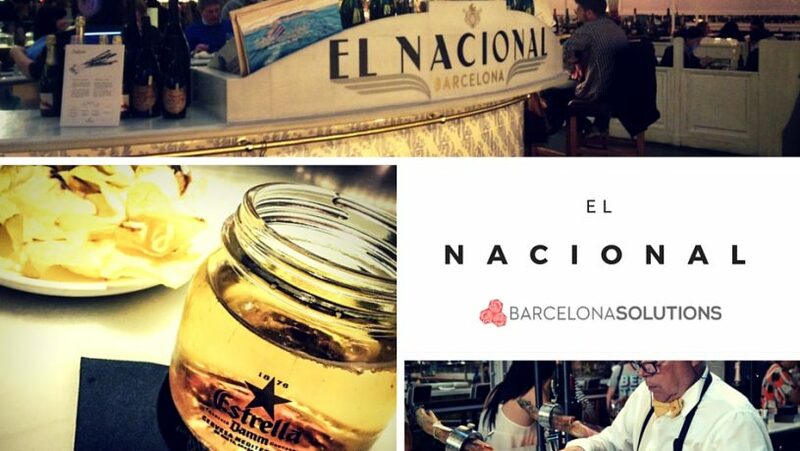 El Nacional is located at Passeig de Gràcia, 24 Bis, 08007 Barcelona between four roads, Passeig de Gracia, Carrer de Pau Claris, Carrer de la Diputacio, Gran Vía de la Corts Catalanes. Access is via a modest entrance on a passageway off Passeig de Gracia. The emporium is open from noon until 2am, every day of the year and 3am on Thursday, Fridays and Saturdays. Typically, it’s busier from 9pm, so consider eating from 7:30 onwards.